Recently, the biggest leak of information has taken place. It is done by the International Consotium of Investigative Journalists (ICIJ) which is a network having spread in over 78 nations across the world. It is the biggest leak in the history of Journalism yet. This leak has been done by an anonymous hacker who has asked nothing except some security measures. It has revealed the name sof various big and mighty people around the world. Mossack Fonseca, a secretive Panama-based law firm is the victim. About 11 million documents have been leaked of the firm pertaining to its clients overseas. The offshore information is yet to release completely. WikiLeaks has created a poll on its official twitter handle to ask people if they should release it or not. Meanwhile, some of the very big names have already been out. As per the leaked information, it is alleged that the firm, Mossack Fonseca has enable people in evasion of tax and laundering of money. Further, the leaked documents suggest that the law firm helps people set up and acquire firms in tax havens across the globe. Offshore entities are not completely illegal, but they are an easy way for money laundering and tax evasion. The leaked documents have revealed that people close to Pakistan prime minister Nawaz Sharif, Argentina footballer Lionel Messi, Russian president Vladimir Putin are linked somehow to various offshore deals. The list includes big and mighty people who are movie stars, professional sports players, politicians, industrialists, etc. From India too, several names have been unveiled. It includes a former Miss World, lawyers, a real estate mogul, and famous business families. They have been found linked to the storm. 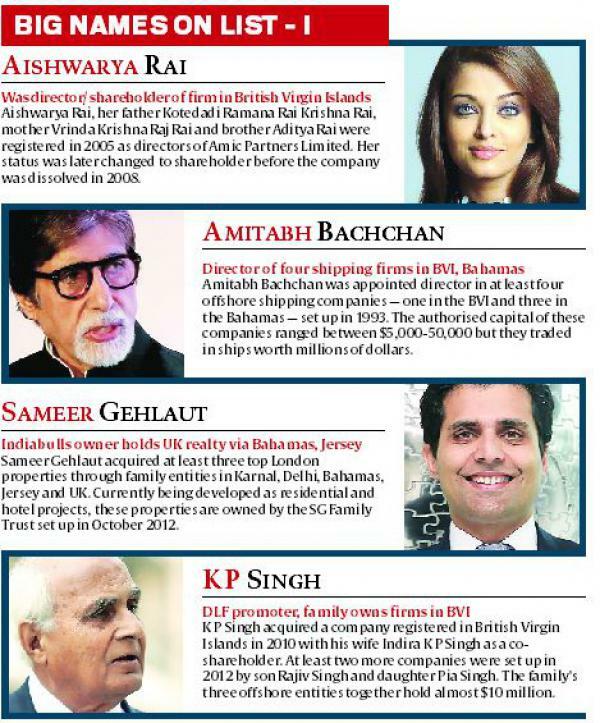 Actress Aishwarya Rai Bachchan, superstar Amitabh Bachchan, businessman KP Singh of the DLF Group, Indiabulls’ Sameer Gehlaut, and Vinod Adani of the Adani group are some of the names among a total fo 500 Indians who have been linked to offshore deals in havens like British Virgin Islands, and the Bahamas. The complete list of Indians in Panama Papers ICIJ leaks is yet to be revealed. However, we already have some of the biggest names linked to the case mentioned below. Scroll a little down to get it. Other names include Mumbai based Garware family, Goa based industrialist Anil Salgaocar, and coporate lawyer Harish Salve. The leak is the first instalment in the series. It is now knwon as “The Panama Papers”. The German newspaper Suddeutsche Zeitung got the informationfrom an anonyomous source. Until 2013, the Reserve Bank of India had prohibited direct overseas investment under the Foreign Exchange Management Act. This act got amended later on and people were granted power to invest in joint ventures or wholly owned subsidiaries. But, some deeper investigation revealed that the various companies involved in the case were setup a long time ago. Also in 2004, the RBI introduced a new scheme known as the Liberlised Remittance Scheme (LRS). It enabled people to have foreign remittances of up to $25,000 in a year by Indian citizens. Later on, it was increased to $250,000. Complete List of Indians in Panama Papers ICIJ Leaks. 1. Amitabh Bachchan: The Bollywood superstar is found out to be a director of four shipping firms set up in the British Virgin Islands and the Bahamas. The report claimed that those companies were made on an anuthorized captial of range $5000 to $50000, but they traded ships worth millions of dollars. He has lots of political connections in India. He was once alleged to be involved in Bofors deal. 2. Aishwarya Rai Bachchan: Former Miss World and Bollywood Actress was found to be a director at Amic Partners Limited set up in the British Virgin Islands. Later on, her status was changed to a shareholder. Aishwarya’s father Kotedadi Ramana Rai Krishna Rai, mother Vrinda Krishna Raj Rai, and brother Aditya Rai were registered as the director of Amic. After one year of her marriage to Abhishek Bachchan, the company was dissolved in 2008. One of her spokesperson said that the reports are completely false and untrue. 3. KP Singh, DLF Chairman: Along with his wife, Singh reportedly reigstered a company in the British Virgin Islands in 2010. The reports stated that he acquired two more companies in 2012 by son Rajiv Singh and daughter Pia Singh. The three companies of the family worth almost $10 million. KP Singh was accused of helping Rober Vadra in purchase. 4. Sameer Gehlaut, Indiabulls chairman: He bought three properties in London using family firms registered in Karnal, Delhi, Bahamas, Jersey, and the UK. The transaction mode adopted for the purchase was kind of complicated which was ultimately led to the SG Family Trust of Sumita Singh, a former MLA, and the Haryana Mahila Congress head, and her husban Jagdeep Singh Virk. Sumita and Jagdeep are the parents of Sameer’s wife, Divya Gehlaut. 5. Garware family: It is found associated with a number of offshore entities in Panamas and British Virgin Islands. Six companies were set up in 2008 and dissolved in 2014. Spokesperson said that the claims are false. 9. Zavary Poonawalla: He is the elder brother of Cyrus Poonawalla. He, his wife, and two daughters are the directors of Stallast Limited, an offshore firm of the British Virgin Islands. Zavary told that they were the directors and income reflected in income tax returns. 10. Indira Sivasailam and Mallika Srinivasan: The former was the wife of Anantharamakrishnana Sivasailam, who died in 2008. Her husband is the chairman of the Amalgamations Group. The reports revealed her as a shareholder in Stanbridge Company. Parents transferred rights to daughter Mallika Srinivasan, the wife of Venu Srinivasan, owner of TVS Motors. Mallika denied any connections to Stanbridge Company Limited. 11. Defence firms: The Italian defence equipment maker Elettronica SpA paid money through two offshore companies for defence contracts with an alleged commissions of range from 5 percent to 17 percent. One of those companies was owned by an India. 15. A retired MP government official Prabhash Sankhla. 16. Chairman of Pune-based Sava Healthcare Vinod Ramchandra Jadhav, Ranjeev Dahuja and Kapil Sain Goel of Bealls International Corporation and agriculture equipments seller Vivek Jain are also named in the list as a director of an offshore company. 17. Russian President Vladimir Putin secretly shuffled as much as $2 billion through banks and shadow companies. 18. Satish K. Modi – Challenge Soccer Ltd, Goldfinch Holding Group Ltd: At first, he was a shareholder, then the rights were transferred to The Challenge Soccer Foundation with a Liechtenstein address. 19. Moturi Srinivas Prasad, a Hyderabad businessman along with two locals – Volam Bhaskar Rao and Bhavanasi Jaya Kumar, are listed as directors/shareholders in these firms: Yes De Ventures SA, Sika Securities Ltd, Bhasu Capitals Ltd and Bee Pee Investments Corp.
20. Bhavanasi Jaya Kumar Offshore entities: Nandan Technologies Ltd, Yes de Ventures SA, Grandbay Canal Ltd, and a total 6 companies registered in BVI. 21. Bhaskar Rao Offshore entities: Nandan Technologies and six associated firms. 22. Preetam Bothra and Sweta Gupta Offshore entities: World Wide Group Holding Limited, Jupiter Group Holding Limited at BVI. 23. Bhandari Ashok Ramdayalchand Offshore entity: sole director and shareholder of BVI firm Ferryden International Limited. 24. Ashok Malhotra Offshore entity: E&P Onlookers Limited at BVI. Currently, he is suffering from cancer so, he didn’t respond. 25. Sanjay Pokhriyal Offshore entity: Panamanian Foundation Colbury. 26. Prasanna V Ghotage and Vaman Kumar: Nordbell Commercial Ltd. at BVI. 27. Pradeep Kaushikray Buch : Overseas Pearl Limited at BVI. 28. Rahul Arunprasad Patel : Amarange Inc at BVI. 29. George Mathew: Soul Rhythm International Limited, Seabridge Group Holdings Ltd, Azaxel Asset Holdings Limited, Hallwood Enterprise Ltd, and The Wonderful Solutions Corporation incorporated at BVI addressed at his address in Singapore and Kerala. 30. Anurag Kejriwal: MP of Loksatta party.